(a). Alginate: A natural polymer derived from the cell wall of some algae. Calcium or magnesium alginate is the most commonly used matrix. They are inert and have good water holding capacity. (b). Chitosan and chitin: They are structural polysaccharides occurring naturally in the cell wall of fungi and the exoskeleton of Arthropods. The various functional groups in enzymes can bind to the – OH group of chitin and can form covalent bonds. (c). Collagen: It is the protenaceous support with good porosity and water holding capacity. The side chains of the amino acids in the collagen and that of enzyme can form covalent bonds to permanently hold the enzyme to the support. (d). Carrageenan: It is a sulfated polysaccharide obtained from some red algae. Their good gelling properties together with its high protein holding capacity makes it good support for immobilizing enzymes. (e). Gelatin: Gelatin is the partially hydrolyzed collagen with good water holding capacity. (f). Cellulose: Most abundant polymer of nature and it is the cheapest support available as carrier of enzymes. The hydroxyl group of the monomer units (glucose) can form covalent bonds with that of the amino acids of enzyme. (g). Starch: A natural polymer of amylose and amylo-pectin. It has good water holding capacity. (h). Pectin: It is a structural polysaccharide of plants found in their primary cell wall and they also acts as the inter-cellular cementing material in plant tissues. Pectin is a gelling agent with good water holding capacity. (a). Zeolites: They are microporous, aluminosilicate minerals with good adsorbing properties and extensively used for immobilizing enzymes and whole cells. (b). Ceramics: They are nonmetallic solids consisting of metal and nonmetal atoms held in ionic and covalent bonds. The composition and bonding pattern varies with different types. (c). Diatomaceous earth: They are silicious sedimentary rocks formed by fossilized accumulations of the cell wall of diatoms. Celite is the trade name of diatomaceous earth. It is a good adsorbent and are resistant to high pH and temperature. Based on support or matrix and the type of bonds involved, there are five different methods of immobilization of enzyme or whole cells. For significant surface bonding the carrier particle size must be small (500 Å to 1 mm diameter). The greatest advantage of adsorption method is that there will not be “pore diffusion limitations” since enzymes are immobilized externally on the support or the carrier. (1). Static process: Immobilization to carrier by allowing the solution containing enzyme to contact the carrier without stirring. (2). Dynamic batch process: Carrier is placed in the enzyme solution and mixed by stirring or agitation. (3). Reactor loading process: Carrier is placed in the reactor, and then the enzyme solution is transferred to the reactor with continuous agitation. (4). Electrode position process: Carrier is placed near to an electrode in an enzyme bath and then the current is put on, under the electric field the enzyme migrates to the carrier and deposited on its surface. This method involves the formation of covalent bonds between the chemical groups in enzyme and to the chemical groups on the support or carrier. It is one of the widely used methods of enzyme immobilization. Hydroxyl groups and amino groups of support or enzyme form covalent bonds more easily. Chemical groups in the support or carrier that can form covalent bonds with support are amino groups, imino groups, hydroxyl groups, carboxyl groups, thiol groups, methylthiol groups, guanidyl groups, imidazole groups and phenol ring. (1). Diazoation: Bonding between amino group of support and tyrosil or histidyl group of enzyme. (2). Peptide bond: Bonding between amino or carboxyl groups of the support and that of the enzyme. (3). Poly functional reagents: Use of a bi-functional or multifunctional reagent (glutaraldehyde) which forms covalent bonds between the amino group of the support and amino group of the enzyme. (a). Chemical modification of enzyme leading to the loss of functional conformation of enzyme. (b). Enzyme inactivation by changes in the conformation when undergoes reactions at the active site. This can be overcome through immobilization in the presence of enzyme’s substrate or a competitive inhibitor. In this method enzymes are physically entrapped inside a porous matrix. Bonds involved in stabilizing the enzyme to the matrix may be covalent or non-covalent. The matrix used will be a water soluble polymer. The form and nature of matrix varies with different enzymes. Pore size of matrix is adjusted to prevent the loss of enzyme. Pore size of the matrix can be adjusted with the concentration of the polymer used. Agar-agar and carrageenan have comparatively large pore sizes. The greatest disadvantage of this method is that there is a possibility of leakage of low molecular weight enzymes from the matrix. (a). Inclusion in the gels: enzymes trapped inside the gels. (b). Inclusion in fibers: enzymes supported on fibers made of matrix material. (c). Inclusion in microcapsules: Enzymes entrapped in microcapsules formed by monomer mixtures such as polyamine and calcium alginate. This method is also called as copolymerization. In this method of immobilization enzymes are directly linked by covalent bonds between various groups of enzymes via polyfunctional reagents. Unlike other methods, there is no matrix or support involved in this method. Commonly used polyfunctional reagents are glutaraldehyde and diazonium salt. This technique is cheap and simple but not often used with pure enzymes. This method is widely used in commercial preparations and industrial applications. The greatest disadvantage or demerit of this method is that the polyfunctional reagents used for cross linking the enzyme may denature or structurally modify the enzyme leading to the loss of catalytic properties. 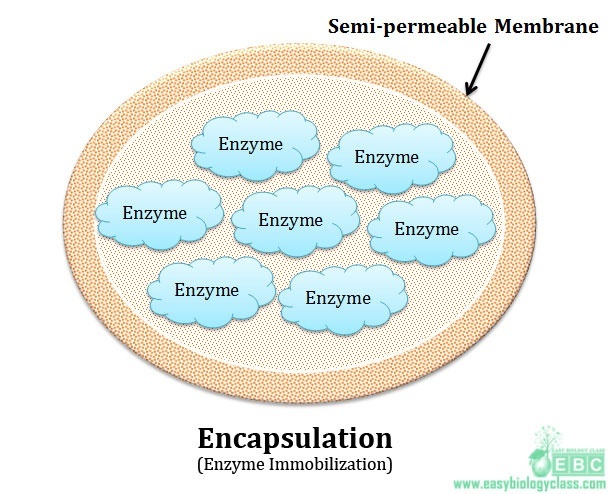 This type of immobilization is done by enclosing the enzymes in a membrane capsule. The capsule will be made up of semi permeable membrane like nitro cellulose or nylon. In this method the effectiveness depends upon the stability of enzymes inside the capsule. Immobilization of whole cells is an alternative to enzyme immobilization and it is a well-developed method for the utilization of enzymes from microbes. Immobilization of whole cells become particularly effective when the individual enzymes become inactive during direct immobilization, or the isolation and purification of enzyme is not cost effective. The greatest advantage of whole cell immobilization is that here the enzymes will be active and stable for long period of time since they are in their natural environment. Use of immobilized cells for fermentation is a very old practice. Bacteria or yeast cells are immobilized by adsorbing it on woodchips. This is practiced in many parts for different types of fermentations. Please share this post for your Students, Colleagues, Friends and Relatives . Posted in Biotechnology, Lecture Notes and tagged Biochemistry, Biotechnology, Biotechnology Lecture Notes, Enzyme, Life Science NET Study Materials.